This set brings together all three of Patrick Lencioni’s successful leadership fables: The Five Temptations of a CEO, The Four Obsessions of an Extraordinary Executive, and The Five Dysfunctions of a Team. Each book combines an engaging fictional story with insightful analysis to address some of the major obstacles facing leaders today. All three of the stories are aimed at helping readers build healthy organizations, focusing on results, not politics. 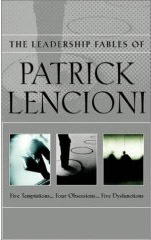 While these tales are set in the business world, Lencioni’s wisdom and practical advice will appeal to general readers and benefit leaders in any field. The classic and consistent design of the trilogy make this a perfect gift set. Patrick M. Lencioni (Emeryville, CA) is President of The Table Group, a management consulting firm specializing in executive team development and organizational effectiveness. As a consultant and executive coach, he has worked with hundreds of senior executives in organizations ranging from Fortune 500 companies and high tech start-ups to universities and nonprofits. Some of his clients include Novell, AT&T, Visa, and The Make-A-Wish Foundation of America. He has worked internationally in the United Kingdom, France, Germany, Holland, Switzerland, Canada, and Mexico.